Indium Corporation has earned the SMT China Vision Award for its Indium10.1HF Solder Paste on April 24 at NEPCON China. 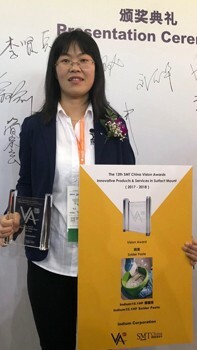 The SMT China Vision Award recognizes domestic and international companies with innovative products and technologies in SMT methods, processes, materials, equipment, software, and management services. Each product entry was evaluated based on its creativeness, technological advancement, and contributions to help reduce cost, improve quality, increase efficiency, enhance reliability, ensure safety, and protect the environment. Indium10.1HF is an air reflow, no-clean, halogen-free, Pb-free solder paste specifically formulated to achieve ultra-low voiding, especially in bottom terminated component (BTC) assemblies. For more information about Indium10.1HF Solder Paste or Indium Corporation’s complete Pb-free solder paste series, visit http://www.indium.com/solder-paste-and-powders/lead-free/ or email askus@indium.com.